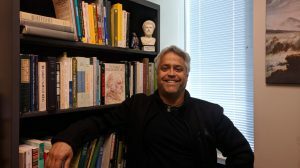 Dr. Mark Fagiano, a visiting lecturer at UCF, has won an international essay competition, the International Journal of Philosophical Studies (IJPS) Robert Papazian Annual Essay Prize on Themes from Ethics and Political Philosophy. The theme for the 2018 competition was empathy. Fagiano’s entry is titled “Relational Empathy.” He will receive a cash prize, and his essay will be featured as the lead article in a special issue on empathy, Volume 27, Issue 2 of the International Journal of Philosophical Studies. “I feel grateful to have my theory of empathy recognized and look forward to seeing how it will be applied to solve interpersonal conflicts and organizational problems. What a theory does is the whole of what it is,” says Fagiano. The Robert Papazian essay competition is established in memory of Robert Papazian, an activist who was executed for his ideas and political ideals. Robert Papazian was born in an Armenian family in Tehran, Iran in 1954. He studied Politics and International Relations at École des relations internationales in Paris. Like many other Iranian political activists abroad, Robert returned to Iran in the summer of 1978, during the last months of the uprising against the Shah, to join the revolution. Subsequent to the establishment of the Islamic Republic of Iran, he continued his activities in Kurdistan as a political and theoretical instructor to a left wing opposition group. He was arrested in Tehran in February 1982. In prison, Robert did not have access to a lawyer and was denied visits by friends and family members. Throughout interrogations in Evin prison, he remained steadfast in his ideals and refused to co-operate with the authorities. It is known through surviving prisoners that he also helped others to be strong and defiant. The Papazian family sponsors the annual reward of €1500.